Built in A.D. 1367 under the architect Rafi from Kazwin in northern Persia. 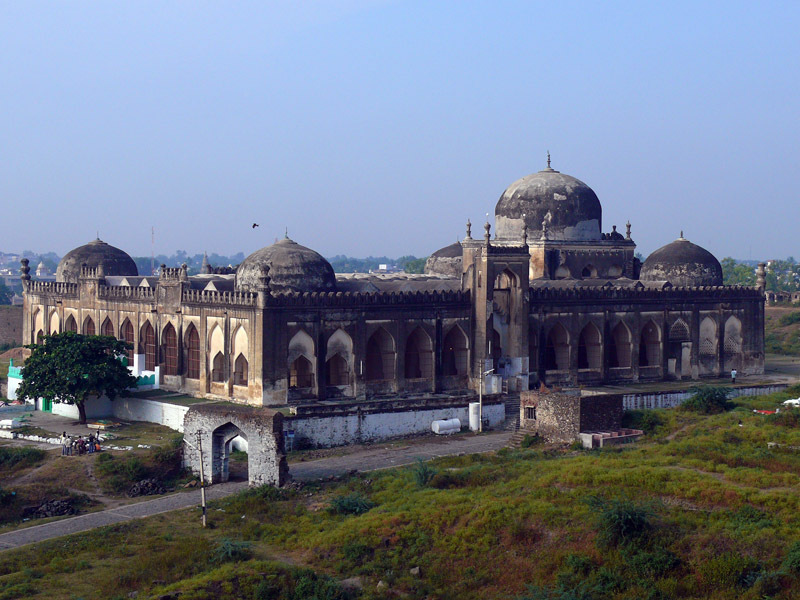 It is a rare example of an Indian mosque without a courtyard as the entire structure is covered with a roof. The style is neither Persian nor Indian, but both are amalgamated so as both can be unidentifiable. The structure measures 216' X 176', with cloisters on three sides and a spacious sanctuary with a dome on the western side. 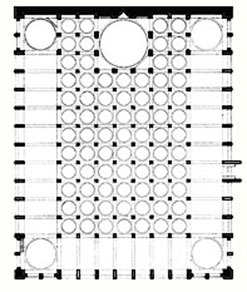 The central area is filled in with rows of aisles forming 68 bays, each roofed by a cupola. The external appearance of the central dome is made lofty and prominent by raising it on a square clerestory, its shape being repeated by the smaller cupolas. The dome is supported on the clerestory by means of squinches, some of the arches being gracefully foliated. Other constructional methods such as oversailing courses of masonry and vaulting are used in the aisles. This indicates a ripe technical knowledge and experience of the builders. The cloisters consist of a series of single archways of a very wide spans and low imposts. In the middle of the northern cloister is a large archway with the entrance which breaks the symmetry of the design. The interior is composed of a perspective of square bays with solid piers and vaulted ceilings in both directions. The building has very little in terms of ornamentation, but is more of an example of intellectual greatness and originality. 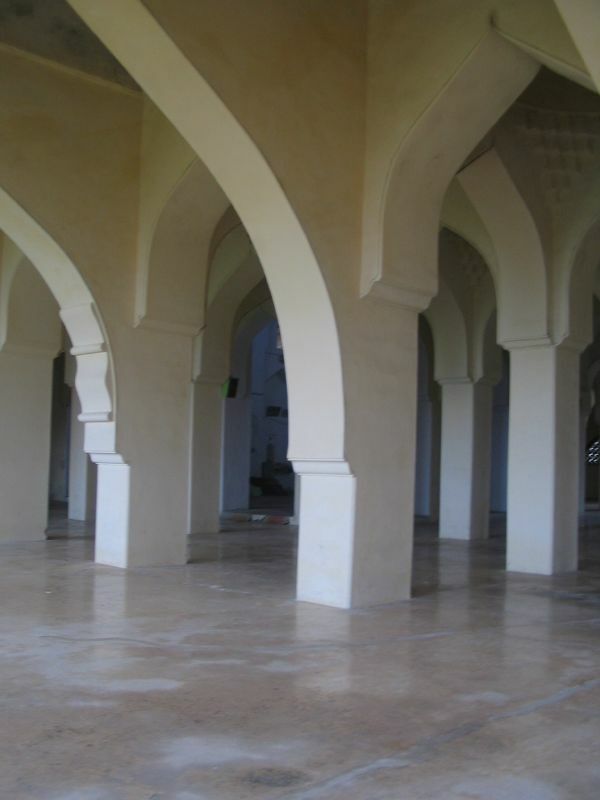 The mosque had a great impact on Deccani architecture, its features like the stilted dome raised on the clerestory and the cloister arches with wide spans and low imposts. 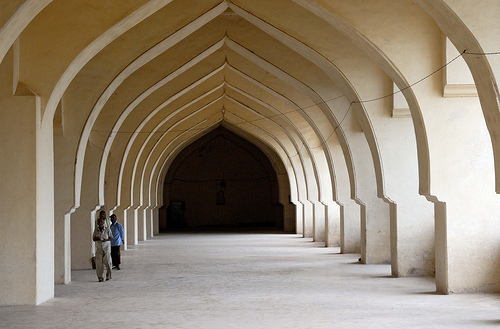 The style of this mosque did not find favour in India, though it may have inspired in a limited way the design of the Kali Masjid and Khirki Masjid built in Delhi shortly afterwards.